"He has an NHL shot already." That's NHL Central Scouting's Al Jensen talking about the Oshawa Generals' Christian Thomas, the son of former NHL star Steve "Stumpy" Thomas. Thomas, 18, is a 5-foot-9, 162-pound right wing ranked No. 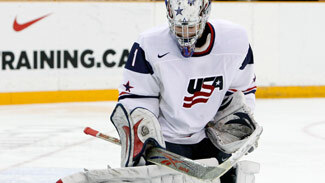 69 among North American skaters eligible for the 2010 Entry Draft by Central Scouting. He moved up 45 spots from the midseason rankings, which were released in January, after scoring 41 goals and adding 25 assists in 64 games while playing for a team that finished ninth in the 10-team OHL Eastern Conference. "I try to make a difference every time I'm out there," Thomas said. "Whether it's an assist, a goal, make a good pass or make a good hit, and there was more scoring this year." Thomas was part of the blockbuster John Tavares trade a year ago that saw the eventual first pick of the 2009 Entry Draft go to the London Knights, with Thomas and a raft of players and picks going back to Oshawa. "I was in London and made a lot of friendships there," Thomas said. "But it was probably one of the best things that happened to me in hockey so far. I was coming from a team where I was playing on the third and fourth lines and I was traded to a team where I was one of the go-to guys and played in the top two lines." Steve Thomas was a small forward with a big shot who rolled off tough checks and fought through traffic to get his scoring opportunities. He had 421 goals and 933 points in 1,235 NHL games while playing for seven teams over 20 seasons. Steve Thomas also had several seasons in which his goals outnumbered his assists. Can son follow father as a finisher? "I would say so by now," he said, adding that his father helped him develop his game. "We worked on my shot a lot. He gave me some pointers. I've been working on my shot the past two years. It's one of the things I'm trying to improve the most, to compromise for my size. "My dad played many years in the NHL so he knows a lot about the game. I try to play my own game and try to set myself apart from my dad. However, he did very well playing for 20 years. It would be nice to have a career like his." Thomas was told that a lot of junior and AHL scorers often get called up to the NHL and placed on checking lines to start their career. He was asked if he could handle such a role, or is he more one-dimensional? "I'm willing to play any role," he said. "If it's getting hard on the forecheck, crash and bang, or try to make good plays, I do it." Thomas' play earned him an invitation to the NHL Scouting Combine in Toronto last month, and while he wasn't pleased with some of his results in the fitness testing, he said he felt like he was in pretty good shape. "I practiced Combine (fitness testing) once last year before the season to kind of get a feel for what it would take to get a good score," Thomas said, adding, "I've been training for the last three months almost specifically for this kind of stuff." Thomas interviewed with 12 teams at the Combine and said he didn't get any of the tricky questions some prospects got. The most interesting question was, "Why do you want to be successful?" "I want to be successful because I looked at my dad playing for 20 years in the League and it was a great life," Thomas said. "I want to be just like him." Thomas was asked what the best thing about him is, not counting the scoring. "Character is huge," he said. "Character makes you what you are. Show some heart and you can go wherever you want."